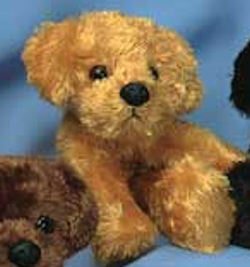 I am looking for a Mary Meyer brand stuffed dog called “Petey Puppy” in the gold color. I don’t know the actual measurements, but it is a smaller one. My 3-year-old granddaughter saw this puppy in a play area of a business and fell in love with it! She was heartbroken when she found out it was not for sale and still talks about the puppy that wanted to go home with her!! I would love to find one of these for her, but have searched all over the internet trying with no luck. The only place I found it was on the company’s website, but they only sell to retailers. I found a brown one somewhere, but I want one the same color as the one that she fell in love with. Please help! Thanks and God Bless!! Gayle sends her thanks, Tami, for looking, but that one is the brown, not the gold. It looked right to me, too! Thank you, Tami, but the one on ebay is brown…I finally heard back from the Northshire Bookstore and they said their inventory count listed must have been incorrect because it showed they had one, but she couldn’t find any…so I’m still looking, but I really appreciate your help!! God Bless! Sorry that one on ebay looks light brown or gold to me. I will keep looking. Thanks so much, Tami, for looking for me…I very much appreciate your efforts!!! God Bless! Here is the dog in gold on ebay. This IS the one I have been looking for….sadly, it would cost me around $37.00 with shipping (more than I can pay)….at least it gives me hope that there are still some out there! Thank you for the information…I do appreciate it! Check this site out. In US but does not appear to list phone #. Looks like it has live chat or email. Do not know what shipping would cost.